Comic infidelity fuels the romatic farce opening at Ignite! Community Theatre. 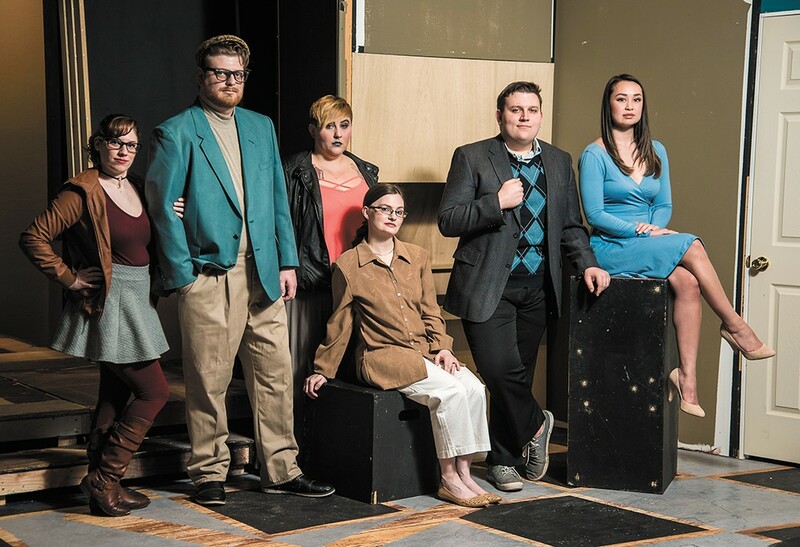 Theatergoers who were left hungry for more after Marc Camoletti's farce Boeing Boeing ran at the Modern Spokane three years ago can have their appetites sated when the follow-up opens at Ignite! this weekend. Don't Dress for Dinner takes place some time after the events of the "prequel," which saw roué Bernard juggling an international trio of stewardesses who flew on different schedules. Until those schedules suddenly changed. Cue the frantic confusion, the hasty excuses, the rapid opening and closing of doors. Bernard is up to his old tricks in Don't Dress for Dinner. He's now married to Jacqueline, one of the erstwhile stewardess from Boeing Boeing, in that most French of arrangements, with both husband and wife involved in separate affairs. Bernard is secretly seeing Suzanne, a Parisian model, and Jacqueline is secretly seeing Robert, Bernard's old school friend from America who attempted to get him out of hot water in the previous play. "If you've seen Boeing Boeing, you'll catch the references, but this show actually stands on its own as well," says director Bryan Durbin. "It's written by the same person, so you've got similar themes going on." In Don't Dress for Dinner, as in Boeing Boeing, those themes can be distilled to a single premise: comic infidelity. Under the assumption that Jacqueline (played here by Emily Geddes) is leaving town for the weekend, Bernard (Nich Fortner) invites his mistress Suzanne (Dana Sammond) to a birthday dinner catered by a chef named Suzette (Stephannie Gerard). Jacqueline, however, gets wind of it and cancels her plans. Robert (Christian Thomas), who's supposed to be Bernard's alibi, soon arrives and mistakes one "Suzy" for another, which, owing to a long concatenation of mixups, misunderstandings and hurt feelings, forces the chef to play the mistress and the mistress to play the chef. That's when the cook's outfit quickly gets torn apart to create a "chic" evening dress. Things spin even further out of control in the second act when Suzette's husband George (Andrea Tate) shows up looking for his wife. "Bernard is trying to have his cake and eat it too," says Durbin. "It's just fun to watch them dig this huge, giant hole and then see if they can get themselves out of it." Durbin has high praise for Robin Hawdon's English translation of Camoletti's play but says the careful balance of interlocking assumptions and circumstances leaves no room for error. "It's a very well-written script, but you have to be almost word-perfect. Someone feeds off one line, and that line gets fed off later on, so if you mess up that line, that joke doesn't work. And if you mess up that joke, that situation doesn't work," he says. As a result, Durbin has come to view Don't Dress for Dinner as "all choreographed — it's really not blocked or staged." And, oddly enough, it's his work on sword-and-ponytail swashbucklers like Three Musketeers and Treasure Island at the Spokane Civic Theatre and Cyrano at Stage Left that has put him at ease with the fluid motion and timing it calls for. "It's so quick with all the lines and the movement that it's basically a huge dance that you're watching," he says. The original print version of this article was headlined "Appetite for Seduction"